Jeniece Andrews invested her life savings — and her family’s money — into an upscale boutique in Ferguson called Hidden Treasures. Attached to a Little Caesar’s restaurant, the store sold jewelry, clothing and accessories to a diverse clientele throughout Ferguson. But late last month, after a grand jury decided not to indict Darren Wilson in the shooting death of Michael Brown, chaos engulfed the city of Ferguson. Andrews' store was one of many buildings that burned in a frenetic night of looting and arson. Thanks to a fireproof protective wall, the interior of Little Caesar’s actually held up pretty well — as evidenced by well-preserved soda bottles in a refrigerator. The remains of Hidden Treasures, Jeniece Andrews' business. Andrews wasn’t as lucky. Her store was a total loss. On the Wednesday after the riots, you could still smell the fragrant musk of burnt wood and smoke with each and every step. “There’s nothing left here anymore,” she added. Like other business owners in Ferguson and Dellwood, Andrews set up a fundraising page online to help her get back in business. But she could potentially benefit from a no-interest loan program organized in part by the St. Louis Regional Chamber. Listen to Jason's story about the challenges of rebuilding Ferguson. The Chamber’s work isn’t happening in a vacuum. The St. Louis Business Council’s Reinvest North County Fund announced on Thursday they’re awarding $119,500 to support businesses and school districts. And some key players within the St. Louis business community promised relief to riot-stricken businesses as well as millions of dollars to help bolster the region’s poorest communities. This damaged sign is next to a vandalized restaurant in Dellwood. But can those efforts make a difference? At least two professors with experience in community building efforts noted that a high-profile effort to rebuild Los Angeles after the riots in the early 1990s there fell flat. They worry that big companies are more focused on philanthropy than with empowering communities. “Because obviously what you’re saying is the agenda will be set by the community — not by the corporation,” he added. Some of the region’s largest companies have made big commitments since Michael Brown was shot and killed in early August. Some have pledged money to non-profit groups, while others promised to expand their footprint within north St. Louis County. Centene said it will build a facility in Ferguson. The company also pledged to hire people from within the city. Monsanto pledged $1 million to several non-profit groups, including the United Way of Greater St. Louis, the Urban League of Metropolitan St. Louis and Legal Services of Eastern Missouri. Ferguson-based Emerson donated millions of dollars to numerous organizations. The company will fund scholarships and employment efforts throughout north St. Louis County. One of the many plywood murals that appeared in Ferguson after the grand jury decision. “I’m hoping this is a start,” Neidorff said. “It's really important that we focus on how this is going to give youth jobs and a chance to learn, develop and be successful. If we can focus on the good and say the ‘past is the past, let’s look ahead.’"
These commitments may seem pretty substantial. But Peter Drier heard similar promises after his city experience unrest and destruction in the early 1990s, following the acquittal of several police officers who were videotaped beating Rodney King. University of Missouri-St. Louis political science professor Todd Swanstrom says businesses have an aversion to funding community organization activities because it doesn't provide instant results. Dreier is a professor at Occidental College in Los Angeles. He recalls the business community there setting up an organization called “Rebuild L.A.” as a response of sorts to rioting that destroyed parts of the city. When the unwieldy group’s promises didn’t materialize, Dreier said it was up to other groups to step up. He said labor unions, activist groups and environmentalists became forces for change within the city. UMSL professor Swanstrom said that some big corporations tend to invest in result-oriented projects — such an effort to shelter the homeless or provide book bags to schoolchildren. They may be less inclined to invest in, say, programs that teach neighborhoods how to conduct meetings or vie for funds themselves. Added Dreier: “What Ferguson and the other cities around St. Louis that have similar problems of poverty and racial segregation need is not more charity. They need more justice. They need more jobs. For his part, Emerson's Sly said that his company plans to give beyond its initial investment — which he said now exceeded $6 million. 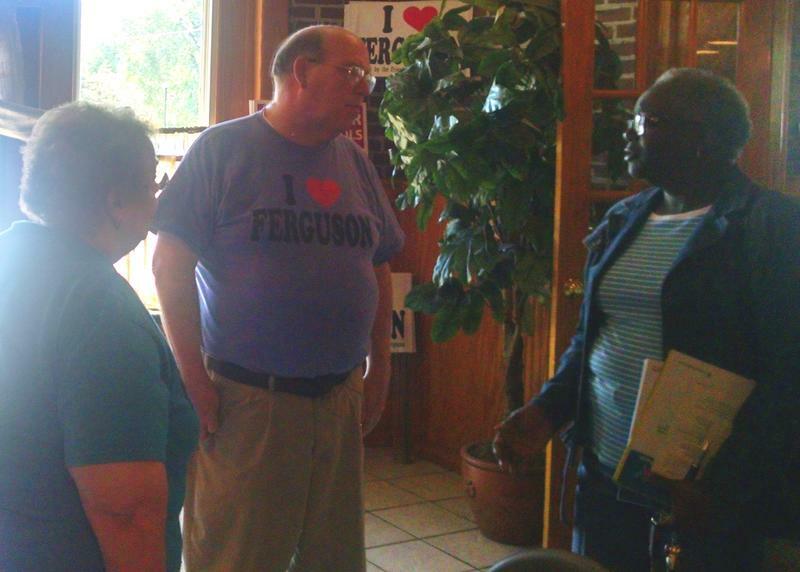 The Ferguson Commission convened its first meeting on Monday. The St. Louis Regional Chamber's Reagan said the business community wants to tackle long-standing problems in the region — including concentrated poverty and struggling schools. He said numerous people in the business community are engaged including some that have been selected to be part of the Ferguson Commission — including Sly and McClure. Reagan said the stakes are just too high for the business community to be on the sidelines. “All of us need all of us,” he added. As Jeniece Andrews was wrapping up her interview with this reporter, a woman named Jackie pulled up to Andrew's burnt out store. She embraced Andrews and joined her in a prayer for revival. 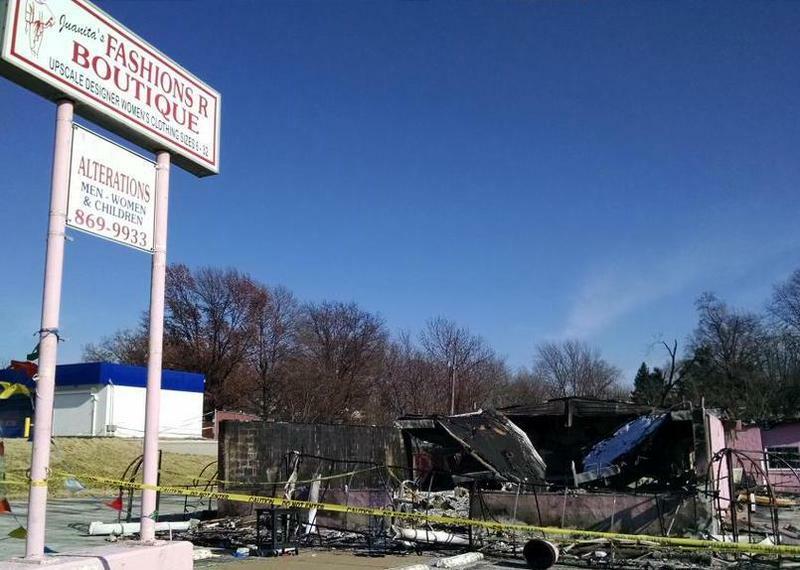 Jeniece Andrews stands in front of the remains of her store on North Florissant Avenue in Ferguson. Andrews said she possesses a deep faith that her business can be resurrected. But she isn’t sure if a no-interest loan from the Regional Chamber is right for her at this point, because it would place her in more debt than she was in before the fire. It’s possible that some business groups could provide grants that would help her get back on her feet. Andrews knows the climb back won’t be easy. But she's committed to setting up shop again. And getting people like Andrews to succeed could be a small test for the St. Louis business community in the midst of some very great challenges. 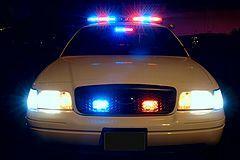 St. Louis Public Radio's Maria Altman contributed to this story. Echoing the mayor of neighboring city Ferguson, the mayor of Dellwood is adding his voice to the criticism of Gov. Jay Nixon and demanding answers in the aftermath of Monday's riots. Mayor Reggie Jones said Dellwood was promised its business district would be protected by National Guard troopers, but he said "they failed to arrive." While Ferguson has "gotten more attention," Jones said, his city saw the most damage and he wants to make sure his city also gets the resources it needs to recover. The St. Louis County Council approved a measure on Wednesday transferring several million dollars to the county police department for its work during nearly four months of protests over Michael Brown’s shooting death. The total transferred from the county’s emergency fund came to approximately $3.4 million. More than $2.5 million of that would pay for overtime officers accrued during the aftermath of Michael Brown’s shooting death. The rest of the money would go toward supplies, food and clothing. After The Ferguson Commission's First Meeting, What's Next? The 16-member Ferguson Commission, created by Gov. Jay Nixon, met for the first time Monday in Ferguson. “It’s a long meeting, but we needed to listen carefully and we needed to get the administrative processes of the commission in place,” commission chairman Rich McClure said of Monday’s six-hour meeting. McClure shares leadership responsibilities with chairman The Rev. Starsky Wilson. 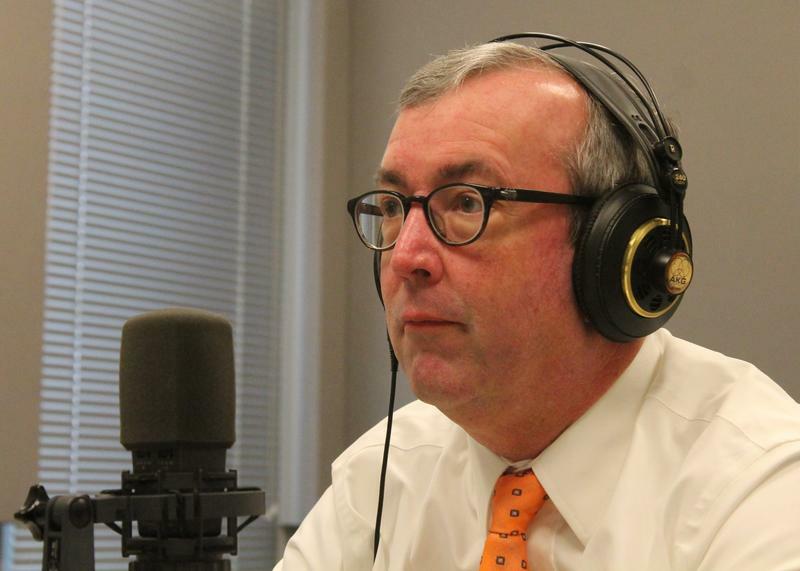 After a Thanksgiving hiatus, the Politically Speaking podcast team is back in the saddle. And this week, we welcome state Sen. Joe Keaveny, D-St. Louis, who will be the new Senate minority leader when the General Assembly goes back into session in January. Keaveny – a lawyer and the 28th Ward Democratic committeeman -- also chairs the Senate’s Democratic campaign arm. He has been in the Missouri Senate since late 2009, when he won a special election to fill an unexpired term. He won re-election on Nov. 4.